During the protests Belarusian authorities detained people to stop them from using their right to freedom of expression and assembly. The picture shows a police car used for picking up people from the demonstrations. During the weekend of 25–26 March 2017, a wave of peaceful protests took place across Belarus. They were met with mass arrests and police violence. Some eight hundred protesters were detained. 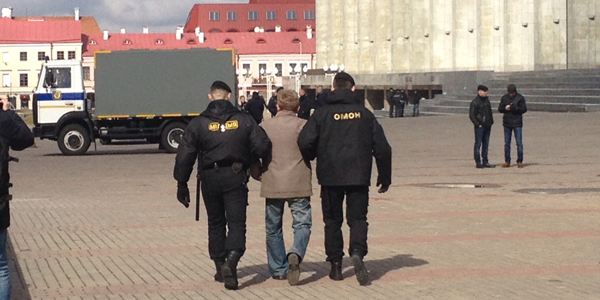 This report includes first hand testimonies and observations of the protests during “Freedom Day” in Belarus in late March 2017. Download the report: Spotlight on Belarus – On the Ground During the Protests.